a journey through this crazy adventure we call "life"
As I decorated for my most favorite season of all, I came across a cute clipboard frame I had bought at Hobby Lobby that is originally meant to hold a picture in the clip. Because I am awful with pictures and we haven’t had any taken since Ben was tiny, and I never print the pictures I do actually have, I wanted to do something different with the frame. I’ve been wanting to work on memorizing scripture, even small verses, for some time now and have never started it up. So I thought this would be the perfect time! 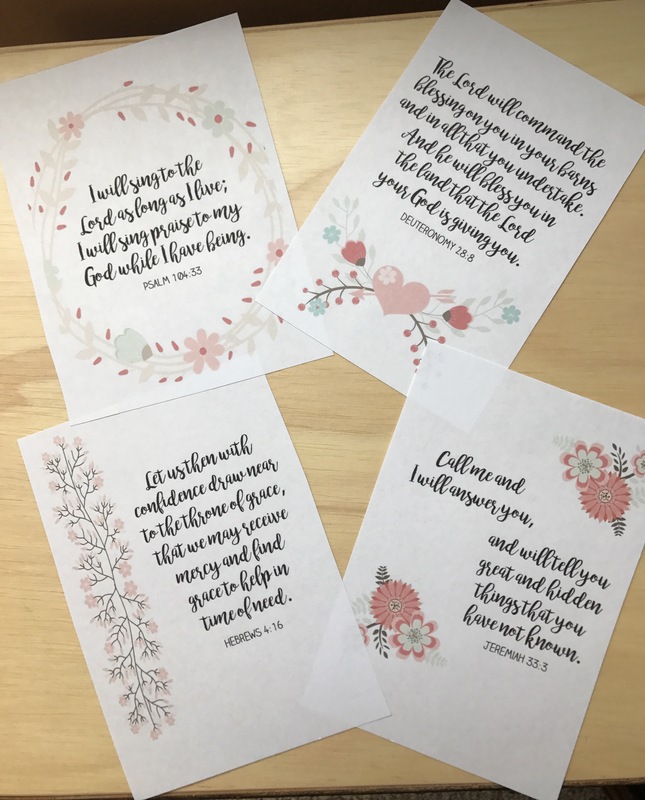 Off to Pinterest I went to find printable bible verses that I could attach to the frame and change out weekly, because if there were anywhere I would find them, surely that would be the place, right?! But alas… I could find four scriptures in one style and ten in another, never finding a large group of scriptures that matched. And for me, it all has to match. And so I present my Weekly Printable Bible Verses! They feature four different matching styles, and are a four-per-page size, perfect for easy display, or for printing on cardstock to use as flash cards, if you’d prefer. Click the link below to download a pdf version of all 52 verses to print! If you’d like to display them as I do, you can either head to a craft/decor store near you, or look here are a few links for cute clipboard frames! Super cute shadow box style frame, so you can add the verses and little knick-knacks if you’d like! I hope you enjoy the verses as much as we will, and that they challenge you to memorize and hold scripture in your heart throughout the day!